Five of those killed were policemen, one a police cleaner and anothera truck driver, said Bogra Sadar police station OC Aslam Ali. He said the accident occurred on the Dhaka-Bogra highway at Sherpur Upazila around 1am. The dead policemen were identified as constables Shahjahan, 35 , 'Pranab', 32, Shamsul Islam, 30, 'Alamgir', 33 and 'Sohel', 32 and a cleaner with the police Shyamal Chandra, 42. Police suspect the other killed in crash was the driver of the truck, rented by police. OC Aslam said that five others injured in the collision have been admitted to the Ziaur Rahman Medical College Hospital in Bogra. 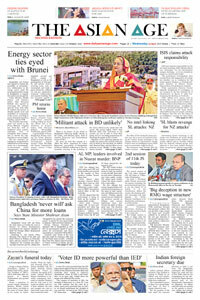 He told bdnews24.com that the policemen killed were posted at the Kurhigram Police Lines and were heading for Dhaka.